This week’s theme is TV. The new dashboard has introduced TV for the UK through your Xbox with Sky TV. You need to have either a Sky subscription or something called Sky Go Monthly Ticket, which is basically an ongoing monthly subscription to Sky instead of a contract. In other words, if you have Sky, you can watch Sky. If you don’t, you can get it without having to shell out for a box and dish installation. Or if you’re me, you now have a new and thoroughly pointless tab on your dashboard. Ah well. 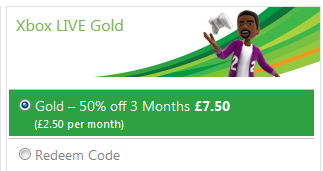 Regardless, Microsoft have also given us a lovely bonus for you guys – a discount code to buy 3 months of Xbox Live at half price. It will change to say “Thanks! Click Here.” Click there. 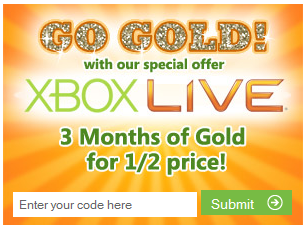 You might be prompted to log in to Xbox.com or confirm your password. Do that. 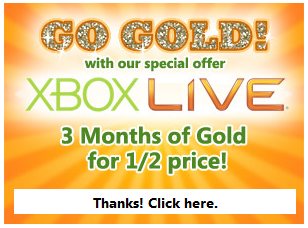 Then you’ll be able to buy 3 months of Xbox Live Gold membership for £7.50. Hooray!